Blog - Page 10 of 15 - Calgary Property Management | Emerald Management & Realty Ltd.Calgary Property Management | Emerald Management & Realty Ltd.
Would you like to maximize your outdoor living this summer? Make the most of your small balcony or patio? Kristin Peila, KP Design Co. has a few tips to help you make your small area as cozy, inviting, and useful as any suburban backyard. Before: Want to turn your balcony into an urban oasis? Tip #1 (below) — Find your design inspiration and use it as the basis for your entire design plan. 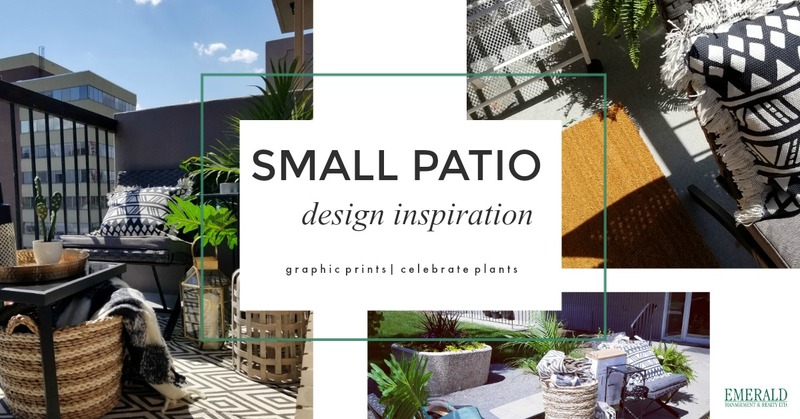 The inspiration for this small patio design came from the graphic prints of outdoor pillows that are on trend this season. The pillows are complemented with the addition of a cozy blanket and a rug. We used two small rugs to fit the size of the floor and space. The rugs helped to pull the entire seating area together by defining the space and providing comfort. Tip #2 (below) –The most pleasing design features is the use of plants. Depending on your sunlight exposure, you may want to pick flowering plants or even better, use plants that can be moved inside when the weather gets colder. Having plants clustered in the corners and at different vertical heights helps to visually enlarge the space. This tip also helps give any tiny area the feeling of a lush garden retreat that can be enjoyed all season long. Tip #3 (below) — This is a rather small balcony being only 30 square feet, so the choice of furniture was vital. Be mindful to avoid clutter and make sure you can easily access all areas of your patio. Modular armless chairs help to create the feeling of space visually and are easy to store. They can also be reconfigured to create an inviting spot to enjoy drinks with a friend or sit quietly and soak up the sun. Tip #4 (above) — Finish the look by bringing multi-purpose items from inside, outside. Use seating that can alternate as a table, or tables alternating as an extra seat, and battery operated candles in a variety of finishes help to create ambiance. In this space, the small side budget-friendly bar cart features a place to hold a towel or a colorful blanket. The bar cart can also serve as a side table, a spot for refreshing beverages, plant stand or a companion to your bbq. Each item used in this space was carefully chosen to make sure it could be used in different ways, such as the ice bucket, which can double as storage for small gardening tools or accessories. We worked with an economical wise budget and the goal was to add style and function with each design feature we chose. The bar cart is a perfect example of dual function and style. Find your inspiration, and it could be a little accessory to set the theme or something as basic as affordable outdoor pillows you found at a local shop or seasonal garden pop-up center. Maximize greenery and flowers using different textures and heights. If you can, purchase plants that can move inside when the weather turns cooler. Visit your local grocery store for seasonal plants and flowers. Choose a small table and armless modular chairs that fold easily and store when not needed. When in doubt choose multi-purpose items to help with storage and keep your space inviting. Bring the inside out. With the use of indoor accessories such as candles you can create a beautiful garden effect in your space to be enjoyed all hours of the day and evening. Living in a small home or apartment probably means that you treasure your outdoor area all the more — but if your outdoor space is on the small side, it can be tricky to know what to do with it. 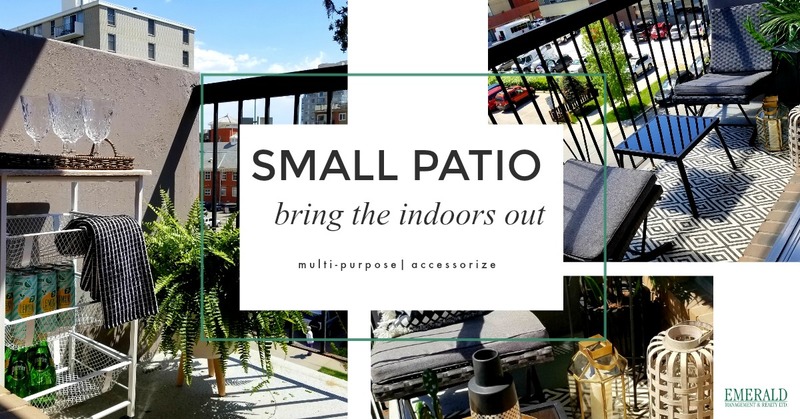 Mix and match these tips to create a new outdoor room like we did at this urban apartment proudly managed by Emerald Management & Realty Ltd. This summer make the most of your small outdoor area space and practice these handy tips. Happy decorating! Congratulations to May’s Resident Manager of the Month! Congratulations to Emerald Management & Realty Ltd.’s Resident Manager of the Month for May 2018: Philippe D.
The Resident Manager of the month is Philippe D. from Viking Arms Apartment located in Calgary, AB. Philippe is an excellent Resident Manager! He has established great tenant relations and has done a wonderful job of finding new residents that fit the building well to ensure happy, neighborly relations continue at Viking Arms. In addition to creating a positive place to call home, the building is always very well kept and cleaned to Emerald’s standard. Thank you Philippe, we are fortunate to have a dedicated Resident Manager such as yourself on the Emerald team. Do you know what to do if there’s a fire in your building? Recently, there have been multiple incidents in condo and apartment buildings where cigarette butts were thrown from balconies and landed in dry planters … which in turn caught fire (providing us a great opportunity to remind smokers that it is very important that they make sure cigarette debris is always disposed of in a fire proof container and properly extinguished). … Be prepared so you know what to do before a fire starts! Be familiar with all exits from your floor (Plan more than 1 way out — just in case one of the exits is blocked by fire or smoke). In the event you are unable to leave your home, make sure everyone knows to call 9-1-1 for further instruction and assistance. Learn about the fire safety features in your unit and in the building (i.e.) fire alarms, fire sprinklers, location of extinguishers, etc. If you find a fire exit blocked by clutter or a door requires repair, contact your property manager immediately. Purchase a multi-purpose fire extinguisher for your kitchen and keep it accessible. Test your smoke alarm monthly by pressing the test button and clean it every 6 months. Mark it on your calendar so that you don’t forget and make it a habit of changing your batteries at least annually. Remember that your alarm won’t be able to protect you if it has no power or the batteries are burnt out. House fires kill and injure thousands every year … and many more are impacted by the loss of valued memories and personal possessions in fire related incidents that could have easily been avoided. In a fire, every second counts … make sure your fire safety knowledge is up to date by visiting the Fire Prevention Canada website for more information. Reminder: Your condominium bylaws (and your mortgage) outline your responsibility to carry adequate insurance. It is recommended that you review the Bylaws with your insurance agent to make sure that you have the right coverage in place. Emerald Management & Realty Ltd., has partnered with Nuera Insurance to help provide a convenient way to purchase insurance in a matter of minutes! To receive a quote on-line, visit Nuera’s website and click on “Get a Quote”. For our valued clients, please contact your property manager to receive a discount code for your insurance policy placed with Nuera. If you have questions about your insurance responsibilities, please contact our property manager or review your bylaws for more information. Congratulations to April’s Resident Manager of the Month! Congratulations to Emerald Management & Realty Ltd.’s Resident Manager of the Month for April 2018: Ziggy S.
Ziggy has been the on-site manager for a condominium property located in the dynamic community of Mission, located in Calgary, AB for OVER 15 years. Ziggy is responsive to building issues and always works in the best interest of the owners to make sure that the property is keep in top-notch condition for the enjoyment of each and every resident. From all of us at Emerald Management & Realty Ltd. and the Board of Directors – Congratulations Ziggy!